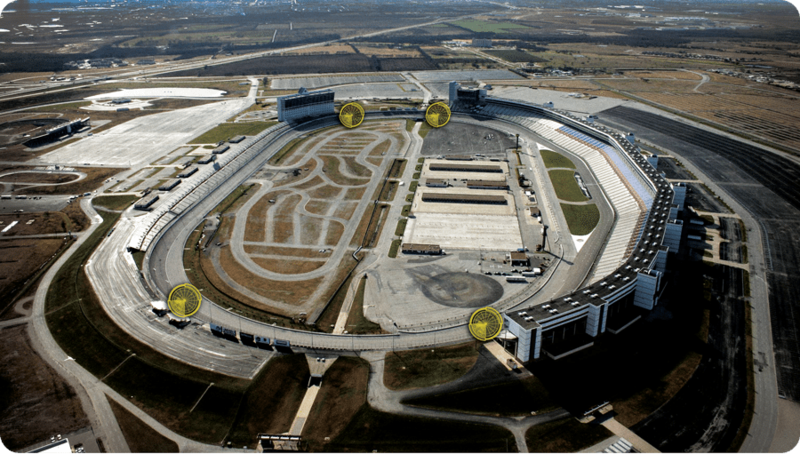 Texas Motor Speedway responded to this criticism immediately, engaging surveyors to shoot elevations across the track to detect any track deficiencies. It was determined that the unlevel areas were not “bumps”; to the contrary, the problem was, in fact, areas of settlement, dubbed “Daleʼs Dips” by the press. Understanding the design of the track structure helps to understand the nature of the problem. The banked turns of the 60-foot wide Texas Motor Speedway sit at a 23-degree angle; therefore, there is a considerable amount of fill material under the upper portions of the track. In these turns, the construction design includes 4 inches of asphalt laid over 12 inches of concrete, which sits atop an approximately 9- inch thick concrete “drainage mat.” Because this is a heavy structure, it is imperative that the fill materials supporting the track be properly compacted. Further complicating the construction of the track are large access tunnels under each turn that provide infield access to the NASCAR racing teams and fans. Due to inadequate compaction of the fill materials around these tunnels, the track had settled slightly on both sides of the tunnel. 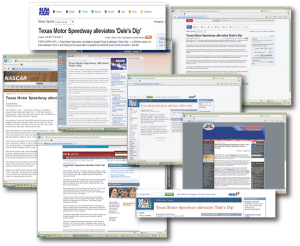 The degree of settlement was so slight that it would not have been detected if it had occurred on a city street, but given the aerodynamics of a race car, it was an issue to some NASCAR drivers. URETEK ICR was selected to make the track repairs for several reasons. First, it was absolutely imperative that the track be lifted accurately; an “overlift” in any area would have severely negative consequences for track officials. Second, the ideal solution must add longevity and sustain rigorous track use for the future. Third, the repair process needed to be completed in a timely manner, as the Speedway hosts training and special event racing almost every week of the year. Finally, the repairs could not compromise the racing surface, which is meticulously maintained to optimize traction. the lifting process and measuring results within hundredths of an inch. The entire lifting process was completed within three days and received high praise from Dale, Jr., and other NASCAR drivers competing in the April Samsung 500 Race. After project completion, URETEK made national headlines for the unique repair process.